It's been over a year since I last updated La Belle Saison. I feel so sad that I stopped writing! Over the past year there were times when I thought I would come back and update ye trusty old blog but I never did because a) I've no doubt lost any readers I was lucky enough to have in the first place and b) I've left it too long now and there'll just be a massive gap in the archives where something crazy and amazing could have happened but because I wasn't writing about it at the time no one will care. But here I am again! Pulled towards this writing platform for the thousandth time like a chubby person (me) drawn back to a weight watchers class after having disapeared a year before, presenting my excuses for my absence once again. And as usual, I can't promise I'll be sticking around, but I do want to. I do! March 2011 : As far as I can remember, nothing happened. April 2011 : I turned 25. May 2011 : Again, nothing special happened as far as I'm aware. Slept for a few hours. Pressed snooze on the alarm clock. Had a freaky dream about me being stuck in a lift with 5 laughing clowns. Any Other Business : Not really. Ok so what the hell has happened in my life over the past year? Sometimes, even in writing, you just can't find the right words. Sometimes a picture is all you need to express the billions of feelings you have inside. I'm not, by any reason, responsible for that! Wait. I might have help a bit for the "result" but not for the absence!!! Haha! It took two to tango mister! 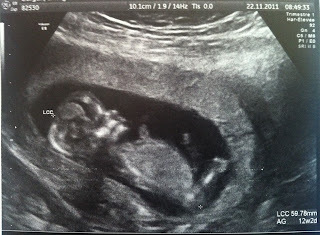 Looks like a boy to me!! She's baaaaa-aaaaaack!!!! Hooray for Linsey!!!! That's excellent news! Hope it's all going swimmingly for the wee man and you! I used to read your blog back in the day, and just happened to stop by again today after thinking, Whatever happened to.... and I see this wonderful news! Congratulations. How lovely! I used to read your blog years ago, and I came by again today after asking myself, Whatever happened to... How lovely to see this wonderful news! Congratulations!